This craftsman's companion celebrates the woodturners, furniture artists, and elite craftsmen from around the world who have taken box-making to a higher level of aesthetic form. Little Book of Wooden Boxes features 31 of today's finest woodworkers and artisans—Bonnie Bishoff and J. M. Syron, Andy Buck, Kip Christensen, Jim Christiansen, Jean-Christophe Couradin, Andrew Crawford, Michael Cullen, Jenna Goldberg, Louise Hibbert, Michael Hosaluk, Robert Ingham, Ray Jones, Kim Kelzer, Steven Kennard, Yuji Kubo, Po Shun Leong, Peter Lloyd, Tom Loeser, Michael Mode, Craig Nutt, Jay and Janet O'Rouke, Emi Ozawa, Andrew Potocnik, Richard Raffin, Ulrike Scriba, Jeff and Katrina Seaton, Tommy Simpson, Jacques Vesery, Bonnie Klein, and Hans Weissflog—who share their amazing techniques, their inventive talents, and the inspiration that fuels their distinctive designs. Each artist’s profile includes full-color, studio-quality photographs of their most spectacular work, including jewelry boxes, desk boxes, reliquaries, keepsake boxes and more, along with insights on their design ideas and objectives. 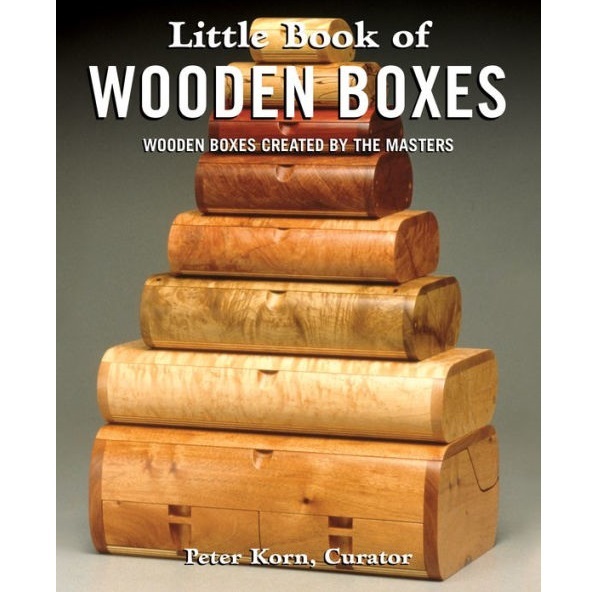 Curated by nationally known historian and author Peter Korn, this attractive hardcover book makes a wonderful gift for any woodworker.